The tying of cloth with thread and then dying it is the simplest and perhaps the oldest form of creating patterns on a plain piece of cloth. It is also the earliest forms of decorated textiles. The great archaeologist Sir Auriel Stien in Central Asia found the art of tie and dye. This form of patterning requires a mastery over dyeing. The fabric is washed. Often it is dipped in a mordant so that it can absorb the dye. The cloth is folded, first lengthwise, than widthwise into four folds. The patterns on the body are then indicated all over the surface with the use of blocks dipped in geru, a red mud color. The cloth is then pinched with the left hand, one knot follows another, using the same thread. After the section, which are to be retained in the background color had been tied, the dying is repeated and the process of tying is carried out. The fabric is gradually dyed to the final dark color, which is either a brilliant red, purple, dark green a deep ultramarine blue or black. Its contrasting color border is created then the body of the sari is tied with thick threads and then covered with a plastic sheet, which is then tied firmly with thick threads. The border is then dipped in another shade. This is the traditional technique for tying and dyeing, which is followed, in all the important centers of Saurashtra and Kutch of Gujarat and also in Rajasthan. Rajasthan, which has developed a different range of colors, has mastered another technique in which the background is in light color while the patterns are in dark colors. This is done by dyeing sections of the sari in the desired color with the use of a piece of felt and then tying. The cloth is bleached and only the tied sections retain the colors. After this the background color is dyed and the finished bandhani emerges, with dark colored doted pattern on a light background. The red chundari, which is used as a veil by young married women in rural areas, is never dyed in fast color bandhanis. Kutch produces the finest bandhanis in India. Mandvi and Bhuj are important bandhani producing centers. The Khatri community of dyers is known for their fine quality of work. They control the trade and the craft, purchasing and processing the material themselves. The dress of the Khatri women, the aba, a long chemise, carries the finest bandhani. It is tied and dyed at the neck, the side openings, the lower border and the sleeves. The end of the salwar and matching ordhnis are also worked with tie and die designs. The finest work is done on the wedding dress, which is enhanced with silver and gold thread embroidery. The gharchola, a sari traditionally made for the wedding, brought by the bridegroom, has a check in gold thread, with a small motif of a lotus or a peacock worked in gold in the center. It carries tie and dye patterns within the square. The famous gharchola of Jamnagar, which is much sought after by the Gujaratis, is tied in Kutch. The gharchola is brought to Bhuj and with help of the local khatris very fine quality tying and initial dyeing is carried out. The final red color of the gharchola is dyed in Jamnagar, as the quality of water is supposed to have properties, which produces the brilliant red color preferred for the marriage ceremony. Most of the traditional patterns such as bavan bagh (fifty two gardens), Ras Leela, depiction of Krishna dancing with gopis, etc. were first made on ordhnis which were worn over skirts, but today these are being created on saris. Saurashtra has important bandhani centers such as Jamnagar and Rajkot. The simple tie and dye patterns worked on the odhnis used by the different tribes are produced in a large number of centers. The Bhil community wears a brilliant red odhni with black borders and roundels. The Rathwa community also wears a similar style odhni, though of a thicker material. The nomadic Rabaris and Bharwads also have tie and dye odhnis and skirts, which are worn by married women. The main color worn by the Rabaris is black with red or maroon tie and dye worked in simple patterns. The Bhawards have more elaborate designs with borders running the length of the odhni while the body has elaborate patterns of parrot, women and trees, as well as flowers. The color is generally a deep russet brown with the designs worked in yellow, green and orange. 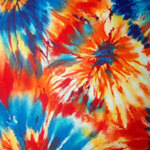 Rajasthan has a number of tie and dye centers. The most prominent are at Jodhpur, Jaipur and Sikar. Sikar produces some of the finest bandhanis and they produce a range of patterns, which are made for different communities in Rajasthan, Haryana and even Punjab. Another form of tie and die, which is a speciality of Rajasthan, is the lahriya and mothra. Here the opposite end of the length of the cloth is pulled and rolled together. They are tied and dyed in different colors producing diagonal multi-colored lines. When the same process is repeated by using the opposite ends, a check, mothra is created. This is done only in Jaipur and Jodhpur. This technique was used generally for turbans made for the Rajputs in Rajasthan. Bandhani technique is worked in north Bihar to create bold patterns in single color. The same technique is also used at Madurai in Tamil Nadu for the production of Sungrdhi saris. These are made by a group of people who originally came from Saurashtra, but later migrated to this area. It was considered essential to wear a tie and dye sari at the time of marriage.